Exactly one year ago, the ground underneath my apartment in Abiko began to shake. 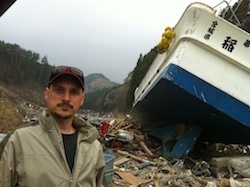 Anyway, I’ve been back in Canada for week visiting family, and today I was invited to give a talk to my niece’s class about the March 11 Great East Japan Earthquake. During the 45-minute session I talked about the Ring of Fire, Japan’s history of earthquakes, and some of the details of March 11th, including the tsunami and the nuclear problems it caused. This was followed by a Q&A, with students asking some good questions – one about HAARP, which I couldn’t really answer. Good food for thought though! The teacher wrapped up with some images/video from the quake that she’d taken from news sources. The class really seemed to connect with what had happened and to be experiencing as sense of empathy with the Japanese kids of their own age who had lost family members along with all of their worldly possessions. It was only a short talk, and probably many of the kids were just happy to have someone in to talk so that they didn’t have to do any class work. But seeds have been sown, and hopefully this will trigger some thought processes about world events, and maybe even inspire some future philanthropists or aid workers. Last week I heard that my friend Doug Wilson was planning a trip with a friend to the earthquake/disaster zone to deliver relief supplies and volunteer for work in the area. I called him to see if there was anything that I could do, and was invited to go with them. I got on the phone to friends and collected money and supplies from people that I knew. Yesterday (27 April) we rented a van and drove up to one of the worst-affected areas, the city of Ishinomaki, Miyagi Prefecture. Along the way we stopped to get more food and supplies that were on a to-buy list that we received from the NGO, Peace Boat. The drive took about 4 hours, and on the way we had to pass through the 30-kilometer “stay-indoor” zone set up by the Japanese government. At this point noone is allowed entry into the 20-kilometer “no-go” zone around the damaged Fukushima nuclear power station, but between 20-km and 30-km evacuation is still optional, although the government does advise staying indoors. We passed through this zone and headed farther North, to the coast. Along the way we began to see cars and rubble that had been left in rice fields by the tsunami when it retreated. That was nothing to compare to what we saw when we finally got to the coastal area around Ishinomaki.